"Our dear, sweet wheaten terrier Biscuit crossed over the rainbow bridge on Friday August 18, 2017. Biscuit was only supposed to be a visitor but she captured our hearts for all of the years she was with us. 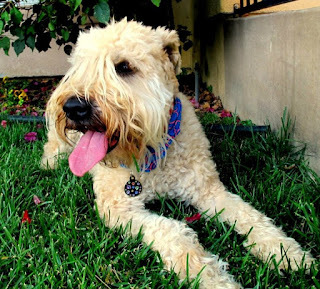 I have a wheaten terrier Murphy and my friend fell in love with my dog and decided to get a dog of the same breed. Although she checked with her landlord before bringing the dog home, he ultimately said that she could not keep the dog. She asked if I would "babysit" until she found another place and then that babysitting assignment turned into a 12 year love affair.